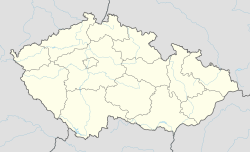 Cerhenice is a market town and municipality in Kolín District in the Central Bohemian Region of the Czech Republic. Also, Cerhenice is the name of the palace in the town. Wikimedia Commons has media related to Cerhenice. This Kolín District location article is a stub. You can help Wikipedia by expanding it.